Hello, not that “Game Center enabled chess” wasn’t on the top of my list, but I think a lot of audio/video editors will be happy to know their second monitor won’t just turn linen in Mountain Lion when they want to go fullscreen. Where does it say it’s not still going to blank the other monitor? How can a company like Apple not deal with this issue? From what I understand, they’re still hand-wringing over the permanent method to handle fullscreen windows. On iOS, the answer is to simply make every activity fullscreen. 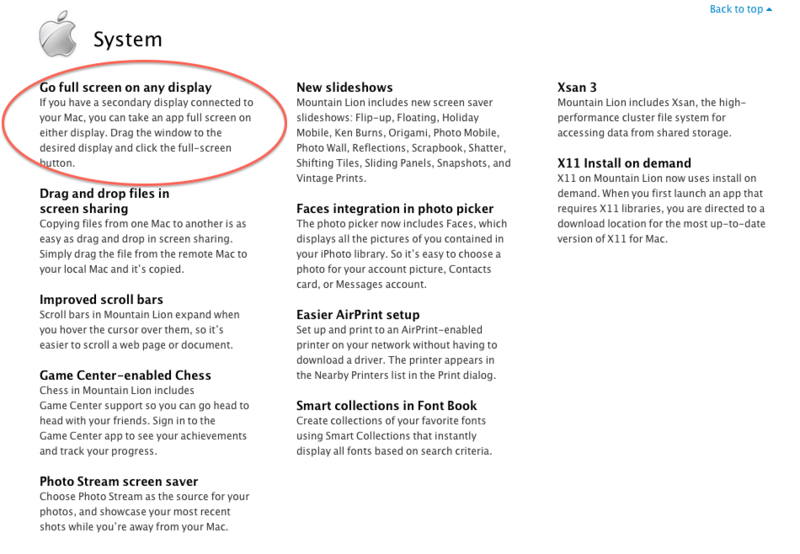 On Mac, “true fullscreen” is a relatively new option – prior to Lion, apps used some kind of hack-y method to achieve fullscreen. Many apps still use the hack method because the new method doesn’t seem done yet. The unfortunate part is that for the few Apple-branded programs that already had fullscreen support (Quicktime X, Keynote, iTunes, even Quicklook) the behavior is still pretty inconsistent. Keynote for instance, works fine – but Quicktime X does the stupid linen thing. In our studio I use our second monitor to play our background loop back out to the mixer for chroma keying. To still have the ability to work with other apps, I had to write a stinkin’ Quartz Composer plugin to play a simple video loop! Will Kuhn, you owe me $20. Mountain Lion didn’t fix anything.. Obviously you never even tried this before writing your little column or you would know that Mountain Lion didn’t change this feature at all. It’s exactly the same problem as before. You’re a hack!! Don’t write about that which you know nothing!! Hahaha – well, it did fix about half the fullscreen problem. At least if I have a QuickTime vid on screen 2 it fullscreens on screen 2 instead of flying over to screen 1 like it did in Lion. How about I owe you a nice hot Coke from the machine that has been turned off all summer in the teachers’ lounge? Haha ok ok we’re cool. But that way-around was do-able (making up two words here) on Lion.. Mountain Lion didn’t affect this issue. I see what you mean now.. In Lion you simply have to switch the primary monitor after going full screen and now you don’t. Big deal. I think this frustrates me even more because it shows that they gave a look at full screen multiple monitor functionality and still chose not to correct this issue. The whole concept of the linen horse-blinders really blows my mind. Just, why?? ps: You’re not a hack just for making a mistake.. I’m just frustrated because a year and a half ago, I chose to set up my audio/video workstation around a mac pro and have lost the functionality of my space because of this one seemingly small issue. Well – the horse blinders effect is certainly strange, although it makes perfect sense in certain apps. For instance, in Final Cut Pro you could say it “reserves” the 2nd screen so you can separate the preview window for bigger viewing – same thing in Aperture. But yeah, in general fullscreen apps feel way more appropriate on a single screen laptop than on a dual monitor Mac Pro battlestation. PS – thanks! I’m going to be doing another Triad article for the October issue, so stay tuned! Do what I do, Run win on a mac pro.I have been doing it for 6 years and my machine is an outstanding workstation! Now my Boss is getting bored and wants to move to OSX, and I keep telling him OSX doesn’t do dual screen, but he thinks is does. I’m gonna make lots of money betting this issue. Previous Previous post: Inter-App Audio!? !